Airline First in EMEA and Asia Regions to Introduce Free-of-Charge Social Messaging Plan OnBoard WiFi Connected Aircraft. Saudi Arabian Airlines (SAUDIA) introduced a new ‘social messaging’ plan yesterday (September 15) which provides guests – regardless of class of travel – with free access to iMessage, Facebook Messenger, and WhatsApp. SAUDIA is the first airline in Europe, the Middle East, Africa and Asia regions to introduce a complimentary social media messaging plan onboard flights. On May 5th this year, SAUDIA initially introduced the free Whatsapp plan onboard domestic flights, which expanded to include all international flights less than a month later, on May 31st. As of today, more than 500,000 guests have logged on and experienced the free Whatsapp plan. Four months later, the airline is now expanding the highly popular social messaging plan to include two additional applications – iMessage and Facebook Messenger. 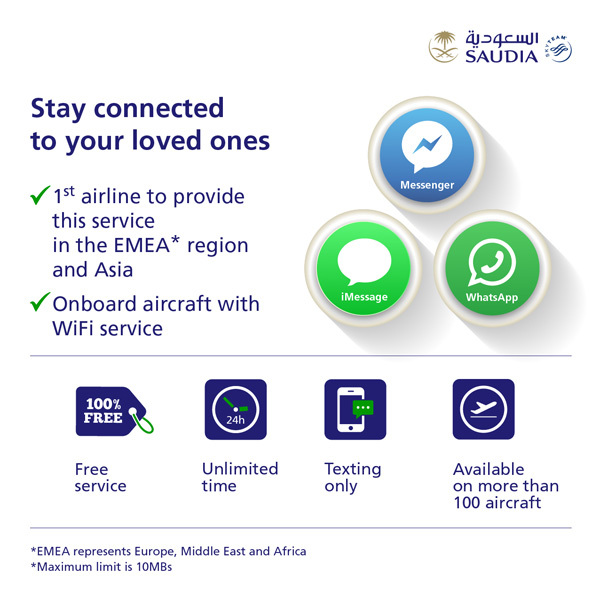 Guests travelling with SAUDIA onboard all flights enabled with WiFi connectivity, will be able to access the social messaging plan through a simple three-step process. To select the service, guests can connect their device to the “SAUDIA_ONAIR” network, and then select the plan and provide an email address in order to activate. Once the social messaging plan is selected, it will be available for the flight duration*. More than 100 aircraft in the airline’s fleet feature SAUDIA’s latest state-of-the-art inflight entertainment systems and features, including onboard WiFi and more than 4000 hours of Hollywood premiere and latest television shows, box sets, music, multi-language, international and children’s programming, as well as digital and audio books, and much more. SAUDIA flies to more than 90 destinations worldwide, with a modern fleet of 155 narrow and widebody Airbus and Boeing aircraft. The airline’s growing route network and double-digit growth has resulted in highest-ever passenger numbers – flying more than 20 million guests from the beginning of the year until end of July this year.